If you're a regular to this blog, then you have probably heard me rave about Anna Elliott and her Trystan and Isolde books. I just finished my second reading of Twilight of Avalon and I liked it even better than the first time around, if that's possible. I am now moving to the second book in the series, Dark Moon of Avalon and to be honest I was kinda feeling bummed because I knew I'd be going through withdrawals once that's read! But, now author Anna Elliott has come to the rescue! She has written a short story based off of a minor character in Twilight of Avalon and has posted it for FREE on her site, though you can also pay $.99 and get it downloaded from Amazon (more info below). You can bet I downloaded it faster than you can say Avalon and used materials at work to bind it, so I have a purty little story and can't wait to devour it! I think this is a FABULOUS idea....not only does it give her current fans a little something special, but for the people who haven't read her, this will give them the opportunity to check out her writing style and get the feel of the books, which I know will make a lot of you guys fall in love with her! 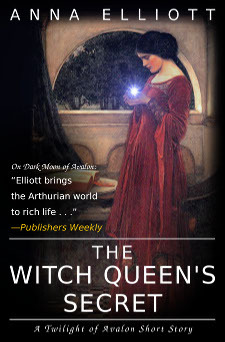 The Witch Queen's Secret is available for free in various e-reader and printer compatible forms on my website here. Or (because of Amazon policy) it's available for 99 cents on the Kindle store here. Dera owes Britain's former High Queen Isolde her life. But as an army harlot, the life she leads is one of degradation and often desperate danger, with small hope for the future either for Dera or for her small son. Through a Britain torn by war with Saxon invaders, Dera makes her way to Dinas Emrys, last stronghold of Britain's army, to beg Queen Isolde's help once more. Isolde offers Dera a new life, both for herself and for her child. But when Dera and Isolde uncover a treasonous plot, Dera must leave her little boy and undertake a dangerous mission, the outcome of which comes to her as a stunning, but wonderful, surprise. And as she risks her life, Dera also draws nearer to Queen Isolde's most closely-guarded secret: one that Britain's courageous witch-queen may be hiding even from herself. OH! How cool is this? I can't wait for the second book to come out. You lucky gal getting to read it first! I'm going to download the story. Thank you so much, Amy! I had such a wonderful time writing The Witch Queen's Secret and hope everyone enjoys it! And I have another freebie short story (a prequel this time) featuring Merlin and Morgan coming in the next couple of weeks! Oh -- this is so perfect! I have to say -- having my eReader has made me a lot more adventurous in my choices. I'll try anything now, since it's effortless for me to put on my reader -- it's not like I'm lugging around a book that I might dislike. Thanks for the lead -- I'm downloading tonight! I downloaded ti already and will be reading it soon! Thank you for the information on this little story. I have a friend who is reading these books and loving them. This will be a nice surprise for her.